Estimating water mass formation rates from CFC inventories. 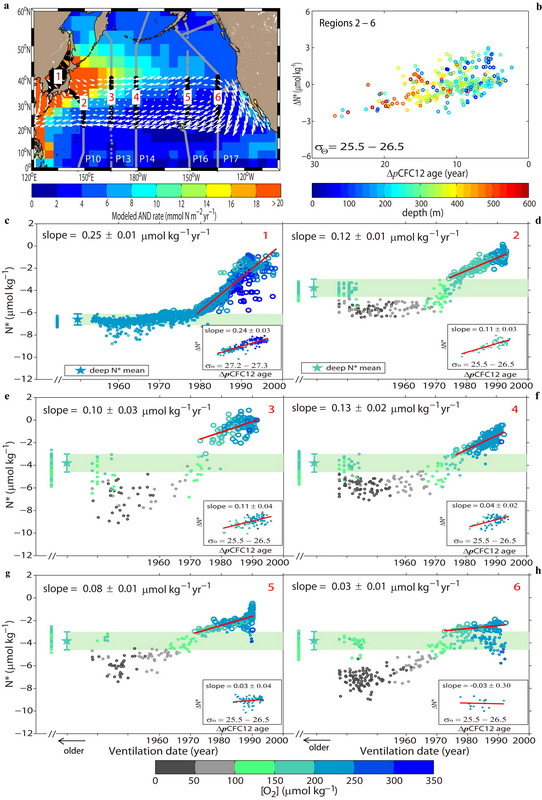 The recent dramatic increase in anthropogenic emissions of reactive nitrogen from northeastern Asia and the subsequent deposition over the open North Pacific Ocean (NPO) has led to a detectable increase in the nitrate (N) concentration of the upper ocean. This result was obtained from reconstructions of the recent history of the excess of N (N*) relative to phosphate (P) in the NPO using nutrient observations from the upper ocean and information about the time passed since the water parcel last contacted the atmosphere, using CFC-12 derived age data. This anthropogenically driven increase in the N content of the upper NPO has numerous potential ecological consequences, including enhanced primary production in this N limited region and a long-term change of the NPO from being N-limited to P-limited.